Dishonour of Cheque—Blank Cheque—Subsequent filing in of an unfilled signed cheque is not an alteration. Dishonour of Cheque—Presumption of debt—The existence of a fiduciary relationship between the payee of a cheque and its drawer, would not disentitle the payee to the benefit of the presumption under Section 139. Comments Off on Dishonour of Cheque—Blank Cheque—Subsequent filing in of an unfilled signed cheque is not an alteration. Dishonour of Cheque—Presumption of debt—The existence of a fiduciary relationship between the payee of a cheque and its drawer, would not disentitle the payee to the benefit of the presumption under Section 139. Indian Penal Code, 1860, S.174-A–Proclaimed Offender-Quashing-Dishonour of Cheque-Petitioner was not served in the case because of non-furnishing of the correct address by the respondent—Thus impugned order declaring the petitioner as proclaimed person and directing the SHO to register FIR is not sustainable-Impugned order quashed-Negotiable Instruments Act, 1881, S.138. Comments Off on Indian Penal Code, 1860, S.174-A–Proclaimed Offender-Quashing-Dishonour of Cheque-Petitioner was not served in the case because of non-furnishing of the correct address by the respondent—Thus impugned order declaring the petitioner as proclaimed person and directing the SHO to register FIR is not sustainable-Impugned order quashed-Negotiable Instruments Act, 1881, S.138. Negotiable Instruments Act, 1881, S. 138—Dishonour of Cheque- Compounding of Offence—Imposition of cost as suggested in Damodar S. Prabhu’s case by the competent court is a matter of discretion-Court can reduce the costs with regard to specific facts and circumstances of a case while recording reasons in writing for such variance. Comments Off on Negotiable Instruments Act, 1881, S. 138—Dishonour of Cheque- Compounding of Offence—Imposition of cost as suggested in Damodar S. Prabhu’s case by the competent court is a matter of discretion-Court can reduce the costs with regard to specific facts and circumstances of a case while recording reasons in writing for such variance. Dishonour of Cheque—Rebuttable Presumption—The presumption under Section 139 of the NIAct can be rebutted by raising probable defence. Comments Off on Dishonour of Cheque—Rebuttable Presumption—The presumption under Section 139 of the NIAct can be rebutted by raising probable defence. Dishonour of Cheque—Offence by company—Director cannot get the complaint against him quashed merely on the ground that apart from the basic averment no particulars are given in the complaint about his role, because ordinarily the basic averment would be sufficient to send him to trial. Comments Off on Dishonour of Cheque—Offence by company—Director cannot get the complaint against him quashed merely on the ground that apart from the basic averment no particulars are given in the complaint about his role, because ordinarily the basic averment would be sufficient to send him to trial. Legally enforceable debt – Even entry of Rs. 200/- was made, but no entry for advancing a loan of Rs. 7 lacs to the accused was made-Complainant has failed to explain qua advancement of loan to the accused and that the legally enforceable debt is not proved— Complaint dismissed. Comments Off on Legally enforceable debt – Even entry of Rs. 200/- was made, but no entry for advancing a loan of Rs. 7 lacs to the accused was made-Complainant has failed to explain qua advancement of loan to the accused and that the legally enforceable debt is not proved— Complaint dismissed. Dishonour of Cheque—Offence by Company—If drawer of cheque (company) is not party, complaint qua accused is not maintainable merely because he was signatory of cheque. Dishonour of Cheque—Offence by Company—Complaint against director but company was not impleaded—Company cannot be allowed to be impleaded u/s 319 Cr.P. C—Complaint quashed. Comments Off on Dishonour of Cheque—Offence by Company—If drawer of cheque (company) is not party, complaint qua accused is not maintainable merely because he was signatory of cheque. Dishonour of Cheque—Offence by Company—Complaint against director but company was not impleaded—Company cannot be allowed to be impleaded u/s 319 Cr.P. C—Complaint quashed. Dishonour of Cheque—Joint Account—Complaint and summoning order against non-signatory of cheque is not maintainable. Comments Off on Dishonour of Cheque—Joint Account—Complaint and summoning order against non-signatory of cheque is not maintainable. Dishonour of Cheque—Second notice is of no relevance and could be construed as reminder notice only. 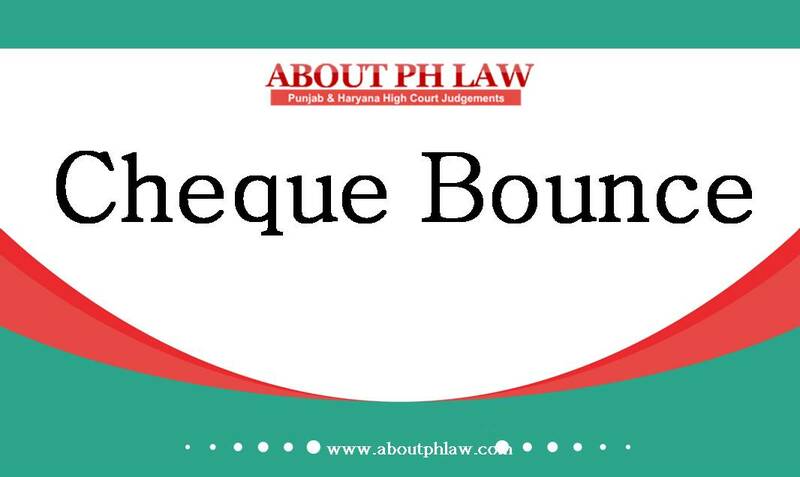 Dishonour of Cheque—Deemed Service—Once notice is sent by registered post by correctly addressing to the drawer of the cheque, the service of notice is deemed to have been effected. Comments Off on Dishonour of Cheque—Second notice is of no relevance and could be construed as reminder notice only. Dishonour of Cheque—Deemed Service—Once notice is sent by registered post by correctly addressing to the drawer of the cheque, the service of notice is deemed to have been effected. Negotiable Instruments Act, 1881, S.138–Dishonour of Cheque- Comparison of Handwriting-Petitioner had given blank signed cheques to the complainant then it is obvious that he had himself allowed the complainant to fill up the same– Therefore, application for taking his specimen handwriting for comparison with the body of the cheques in question has been rightly dismissed. Comments Off on Negotiable Instruments Act, 1881, S.138–Dishonour of Cheque- Comparison of Handwriting-Petitioner had given blank signed cheques to the complainant then it is obvious that he had himself allowed the complainant to fill up the same– Therefore, application for taking his specimen handwriting for comparison with the body of the cheques in question has been rightly dismissed.